Think of a piece of content your team published recently. On a scale of 0 to 100, how would you rate it? And how would your rating help your company? Stumped? 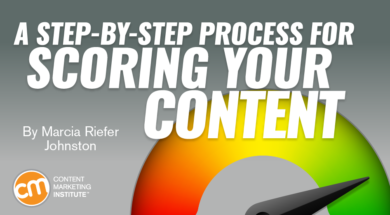 Consider the method that Jared Whitehead devised for scoring content performance. Jared works as an analyst in the marketing operations group at Red Hat. After 10 years of growth and acquisitions, the B2B technology company found itself in “constant chaos” with its approach to content. Leigh Blaylock, who manages Red Hat’s global content strategy group and worked with Jared, notes the company “had so many acquisitions, so many products, so many marketing teams” that no one knew what content was meaningful and what content to say no to. Last year, Jared, Leigh, and their colleagues set out to get Red Hat’s content under control. They wanted to figure out what content they had, what they wanted to keep, what was and wasn’t performing, and what “performing” even meant. Red Hat’s new content-scoring method is proving its business value by giving content teams a consistent way to assess the performance of individual pieces of content so everybody knows what content to say no – or yes – to. Leigh and Jared shared this initiative in their Content Scoring at Red Hat: Building and Applying a Repeatable Performance Model presentation at the Intelligent Content Conference. A content group develops a scoring method that others follow. A cross-departmental group develops a scoring method that works for all. Either approach can work. Choose what makes sense for the people and content in your situation. Either way, pick people to contribute to the performance scoring methodology who have the big picture of the content and have a sense of the systems used for creating, tagging, distributing, and managing that content. When you have people who understand the content to score and the systems supporting that content, you have a better sense of the other skills needed on the team. For certain things, you may want to hire help; for other things, employees may be natural choices. The Red Hat team started the initiative in 2012 by standardizing its content types – white papers, data sheets, infographics, etc. – across the marketing organization. It wanted all business units to have a common understanding of each type of content the company produces. To accomplish this foundational governance work, Red Hat invited a representative from each marketing team to participate on a core team that developed standards for the types of content they worked on. If you approach content scoring as a cross-functional team, as Red Hat did, you need to standardize content types across departments. If, on the other hand, you’re a single content group developing a scoring method, you don’t need to gather representatives from the other groups but you still need to standardize the content types in your group. They had to figure out a way to identify – and get approval to remove – the dusty content assets owned by multiple groups who invested time and money in those assets. They found 419 content assets more than 18 months old, listed those assets on a shared sheet, identified owners, and asked them to decide which assets needed to remain available. We didn’t want a simple keep-it-in-there or no. We wanted to understand why they wanted to leave it in there. Was it being used in a nurture campaign or promotion? If so, we could sometimes suggest an alternative. Eventually, by weeding out the ROT (redundant, outdated, trivial content), they reduced the 1,700-plus assets to 1,200. After cleaning up shop, the Red Hat team turned its attention to analyzing the remaining 1,200 content assets. Jared created a content-scoring method to apply across all content types and content groups. In other words, depending on the group or the content type, people had various ways of determining, “We’re winning. We’re doing our job.” It was up to Jared to devise a universal way of scoring content performance. He needed to get everyone speaking the same language. That lingua franca of numbers had to work for people who love the geeky aspects of analytics as well as for those who prefer plain English: Did this content work or not? Did it do what we wanted it to do? Jared devised a scoring method that gives each content asset an overall score between 0 and 100. This number is derived from four subscores – Volume, Complete, Trajectory, and Recency ­– each of which is a number between 0 and 100. The overall score includes a weighting factor, which accounts for the relative importance of each subscore for a given asset. The Volume subscore is a relative measure of traffic. “This number is relative to all other collateral within our resource library. It’s not specific to a particular content type,” Jared says. The Volume subscore speaks to awareness. It’s a ranking. It shows how many people have seen a given asset compared to the views of other assets on the site. Example: If a Red Hat web page, which contains a downloadable white paper, receives more traffic than 60% of the other Red Hat web pages with downloadable assets, that web page gets a Volume subscore of 60 out of 100. The Complete subscore is the percentage of visitors who download an asset. Example: If 40 of 90 visitors download the white paper on a given page, that’s a 44% download rate. That page’s Complete subscore is 44 out of 100. The Trajectory subscore reflects a trend. Example: In month one, a web page has 900 visitors. Month two, 600 visitors. Month three, 300 visitors. Traffic to that page is declining. At Red Hat, that negative slope equates to a Trajectory subscore of 0. If visits had increased over those three months, the Trajectory subscore would reflect a positive slope. The higher the slope, the higher the Trajectory subscore. 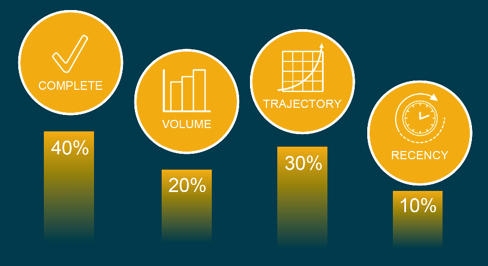 Determine the Trajectory scale according to what you hope to glean from the analysis and what is most useful to your organization, Jared says. Each company defines a strong slope differently. For example, if you consider a slope of 10, as shown above, to be strong – interpreting that this asset gets an average 10 additional visitors per week – you might give it 100 points on your Trajectory scale. You can determine your slope point scale arbitrarily (any slope greater than X gets Y points) or you can assess the average slope of all assets and base your scale on that distribution. The Red Hat team understands that an outlier can affect slope. It could have zero views one month, zero views the second month, and then two views in the third (the outlier). Trajectory is going up. While that’s a positive sign, it doesn’t necessarily indicate steady traffic. Outliers are accounted for in the Recency subscore, which indicates whether traffic was maintained and steady during your analysis window. The asset’s Recency subscore in July would be 30 points (0 + 0 + 20 + 10) out of the 100 points. For each content asset, the four subscores rank differently in importance and are weighted accordingly. In other words, the weighting of subscores is unique to each content asset to emphasize what the team values most about that asset. Each subscore is assigned a weight percentage, enabling the standardized overall scores to take priority variations into account. Because of this weighting, one asset’s overall score can be more usefully compared to another’s. The overall score is neither good nor bad. It takes on meaning only when compared to the overall scores of the rest of the content – which is why the score was normalized using weighting percentages. The overall score enables the team to compare various types of content and metrics that would otherwise be difficult to compare. There’s no absolute scale to indicate what to make of an overall score of 45. If the rest of the content assets average 32, a 45 is fantastic. It means that this piece is doing well. If the content assets average 60, though, an overall score of 45 prompts the team to investigate why this piece of content is not performing as well as its peers. Scores simply provide one way of estimating the performance of individual content assets. Ultimately, people must consider what’s behind the scores and decide what actions make sense. 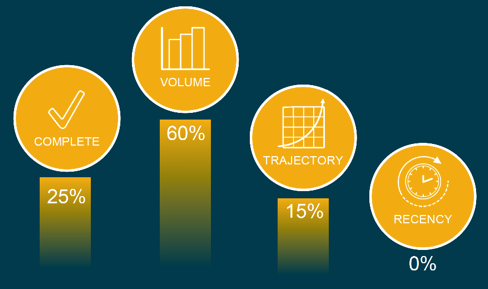 Content scoring isn’t a quick process, and it requires many stakeholders. How do you get people to spend the needed time on this process – to put aside other work to do it? Jared and Leigh suggest starting with a proof of concept to show the team what type of new insights can be gained. Red Hat uses this experimental period to gather feedback from those who will participate in the project. “When you call something a proof of concept, they’re more willing to give you critical, helpful feedback than to just glance over it and say, ‘No, that won’t work here,’” Leigh says. Red Hat’s proof of concept was built as an analysis sandbox in a workbook of spreadsheets with data from an API on their web analytics platform. After the data was pulled into the workbook, Jared built functions and calculations to summarize the data into an experimental content-scoring model. He then shared this data as CSV files for others to review and comment on. Once stakeholders approved and reviewed the content-scoring model, the content team presented the model in a roadshow manner: They gave talks to the marketing leadership team and to a few marketing teams to gather feedback and encourage adoption. From there, after more people in marketing understood the model and its potential, Red Hat colleagues began asking Jared, Leigh, and Anna for analyses. The current iteration is not far from that proof-of-concept workbook. Red Hat is moving into a final phase that will include a dashboard utility, refreshed daily, that everyone in marketing can see. Start with something. Anything. If you have an idea or a general feel for what you are trying to accomplish, build what you can with what you’ve got. Others have a much easier time understanding your process and goal if they can see and play around with a prototype. After your proof of concept and once you have a scoring method, your job has just begun. If you throw your method out there and walk away, “It will die within a month. No one will use it,” Jared says. With HTML content, we can dive into the asset itself. As opposed to saying just ‘Yup, they downloaded it,’ I want to know, how much time did they spend with that asset? How far did they scroll? We want to bake that type of information into the score. Consider what kind of insights into your audience you want, and look for ways that your scoring method might provide those insights. Red Hat now audits its content quarterly. “We don’t want to go through all our assets at once again,” Leigh says. Each quarter, the team identifies assets that haven’t been updated in 18 months and those performing in the bottom 20% of the overall scores. Though content age and score alone don’t tell the team what to archive, that information identifies which assets to consider archiving. “Chances are, that content is not performing well – but maybe it is,” Leigh says. “Maybe two years ago we created an asset that was so forward-thinking that people are just starting to navigate to it and access it.” To filter out pieces like that, the team also notes the Trajectory and Recency subscores. They then list all the candidates for archiving in a shared sheet, identify the content owners, and give those owners one month to assess which assets can be archived. “We’ve done that now for two quarters, looking at about 65 assets per quarter. I expect that number to go down,” Leigh says. Got questions for Leigh and Jared? Got insights of your own to share? Let us know in a comment.